When I first applied for my current job inHong Kong, one of the main attractions was that there would be some cooking lessons with the kids. I imagined how much fun it would be, making little fairy cakes and festive-themed treats, converting the children into master chefs. It isn’t turning out quite like that! Firstly, I had an entire week of solid cooking classes, which is a bit much to bear even for me. Part of it was a real pleasure – the kids who were really excited by the culinary magic unfolding before their eyes, the look of terror when I asked for volunteers to crack eggs, the sheer relief when it worked out okay. But there was also the stress: children too hyper to focus on the task at hand, their inability to combine the ingredients as well as I’d like, the fact that every single cupcake lesson ended with someone dropping one of their cakes icing-side-down on the floor. And then there’s the frustrating fact thatHong Kongkids, unlike their British counterparts, just aren’t that keen on sweet things. Cupcakes on their own: fine. Stick a bit of icing on, and they cry like babies “Too sweet, can’t eat”. For me, part of the downside is also that the recipes are fairly basic – it makes sense from a financial point of view, not to mention the fact that we’re working against the clock and it isn’t really a chance to master baking techniques so much as just practising English in a slightly different scenario. So every lesson I have to fake my enthusiasm that the treats we’ve baked are “the yummiest things ever!”, when in reality I know I have much better recipes at home. So, after making fairly dry, unexciting chocolate cupcakes with the kids at school, I decided to make some chocolate fudge cupcakes at home. These are based on a recipe from the BBC Good Food magazine – the original is for a traybake, cut into triangles and topped with a gooey, chocolaty icing and sprinkles. Back in June I made a small, round cake with this mix for my friend Neil (I never turn up empty handed when I’m invited to stay – just so everyone knows! ), complete with the icing but minus the sprinkles – I thought it already had enough going on. It was a gorgeous cake, exactly what I’d hoped for. 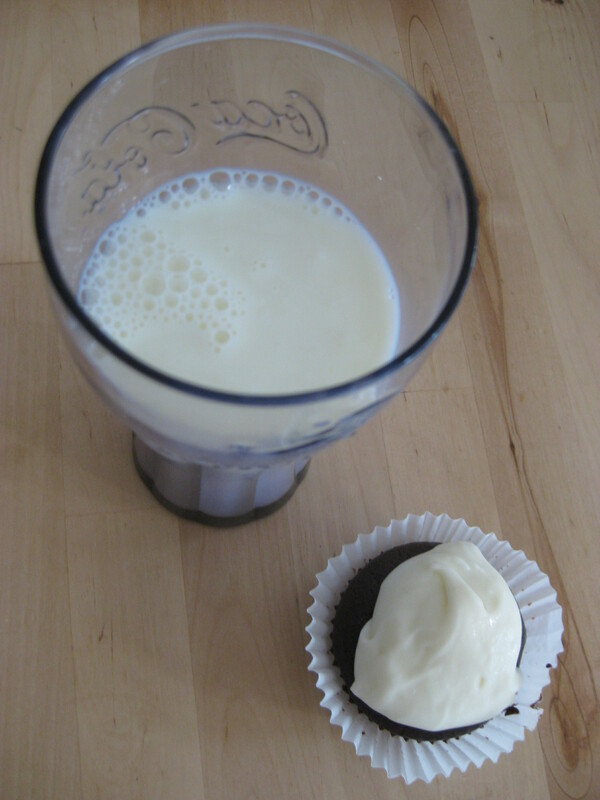 So I thought I’d give it a go in cupcake form, this time with simple yet sublime vanilla butter-cream icing on top. The cakes are very chocolate-y and decadent, but they didn’t rise much in the oven and aren’t too overwhelming – you can definitely eat two in a row (trust me, I’ve done the necessary research!). 1. Heat oven to 160oC. Line a muffin/cupcake tray with paper cases. 2. 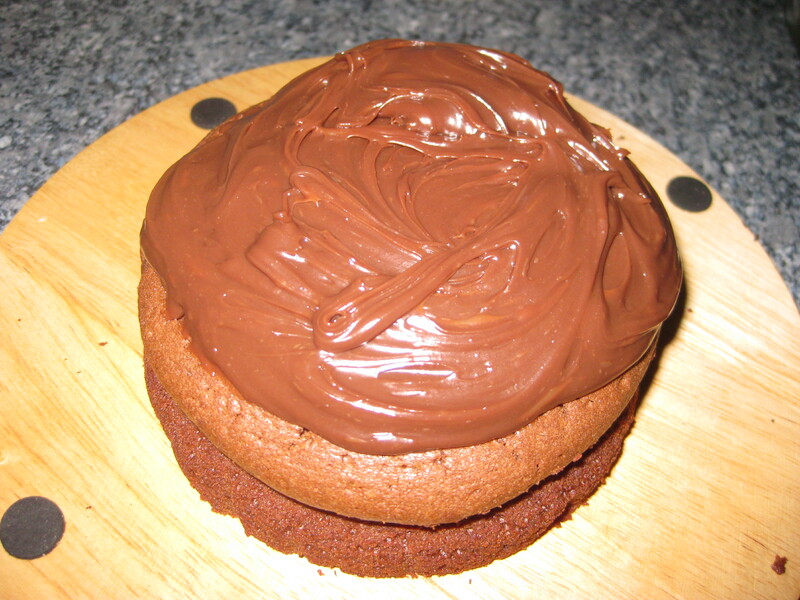 Put the chocolate, butter and sugar into a large pan with 100ml hot water and gently heat until melted together. Set aside for 2 minutes to cool slightly, then stir in the soured cream, followed by the eggs. 3. Next stir in the flour and cocoa, mixing until it forms a smooth batter. Beat the butter, milk, vanilla and half the icing sugar until it becomes quite smooth. Then gradually add the rest of the icing sugar, beating constantly until smooth and creamy – I had to add about 100g more icing sugar, but I’m not sure if that’s just one of the many differences inherent in cooking in such hot, humid climes! When it’s ready, dollop it onto the cupcakes, or pipe it if you prefer. The better quality your ingredients here, the better your icing will be (I know that’s common sense anyway, but it makes such a big difference with icing – it’s worth a splurge on good vanilla essence and butter, in my opinion). 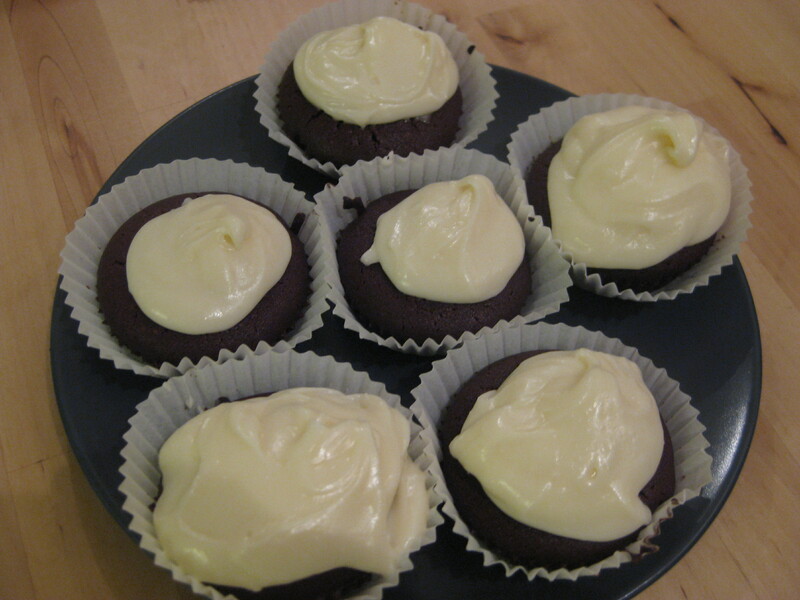 This entry was posted in Vegetarian Recipes and tagged baking, buttercream, cake, chocolate, fudge, icing, sweet, treat. Bookmark the permalink.